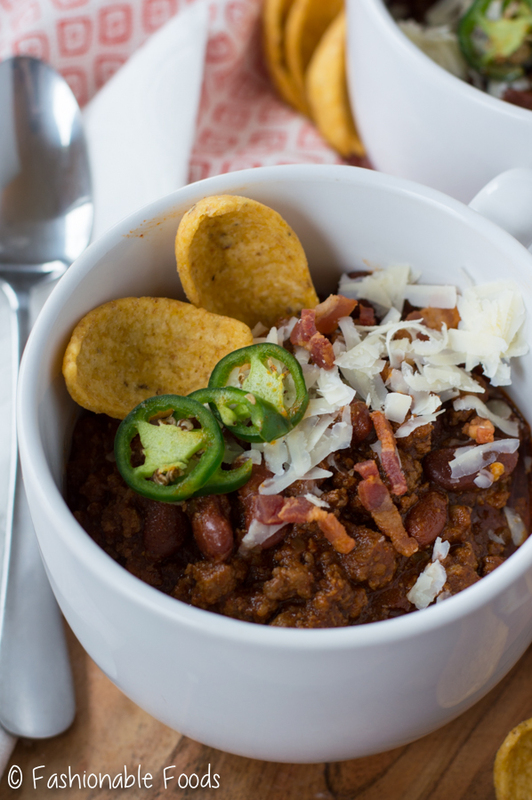 Nothing is more comforting during the winter than a warm, messy bowl of chili! Everyone has a favorite way of making chili and this is mine. 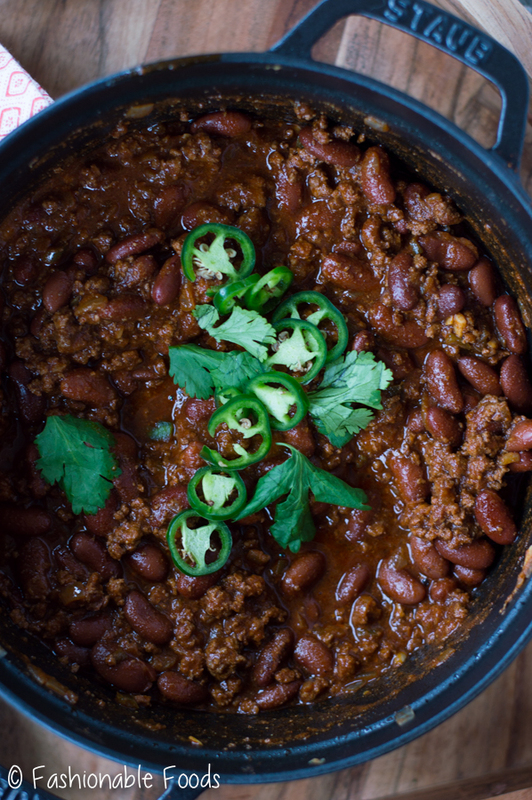 Chili is a wintertime classic. It’s full of warm spices, fun toppings, and is ultra comforting. Everyone seems to have their favorite recipe, and today I’m sharing mine. 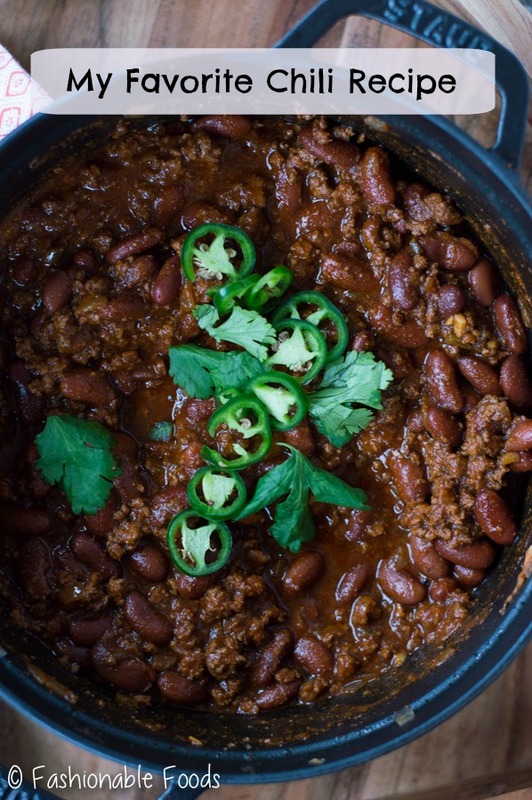 I’ve spent years searching for a go-to chili recipe. And if it weren’t for my chili-loving husband, I probably would have given up on finding that perfect recipe. 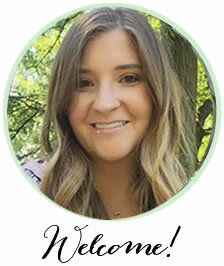 Chili has never been a favorite of mine – no matter what recipe I tried, I would always be left a little disappointed. The funny thing is, the inspiration for this chili has been right under my nose in an old family recipe book. With the internet and Pinterest, I hardly ever look in my recipe cabinet, but I went on an organizing spree last month (totally nesting) and stumbled across the old book. It’s actually a diary dated 1941 and in it are pages filled with all kinds of handwritten recipes. 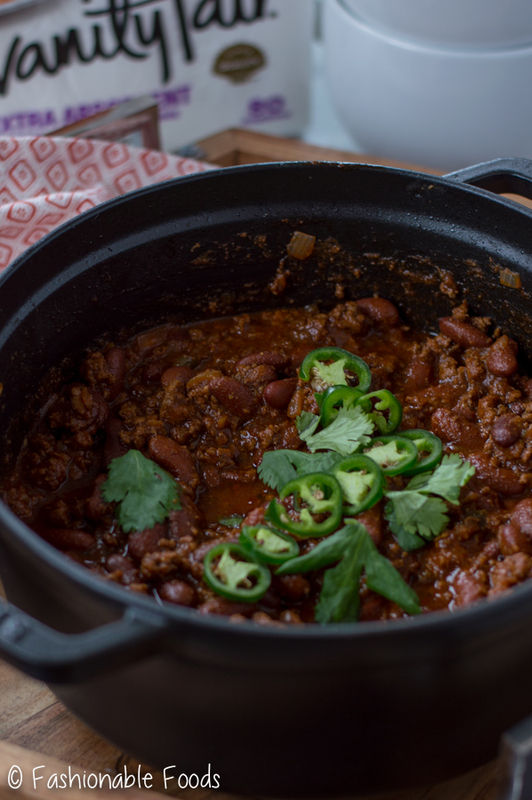 A few pages in, I saw a simple chili con carne recipe and knew I had to try it! Of course I had to add my own spin on it, but something told me it was going to be a winner. The original recipe included ground beef, onions, spices, kidney beans, and tomato juice. I added bacon and jalapeños, but otherwise left everything else the same. 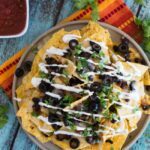 It’s a really simple recipe and I think that’s why it’s so darn good! Chili, while delicious, can get pretty darn messy. It’s one of those dishes that has always required a bunch of napkins, or skipping the napkin all together and going right for a paper towel. 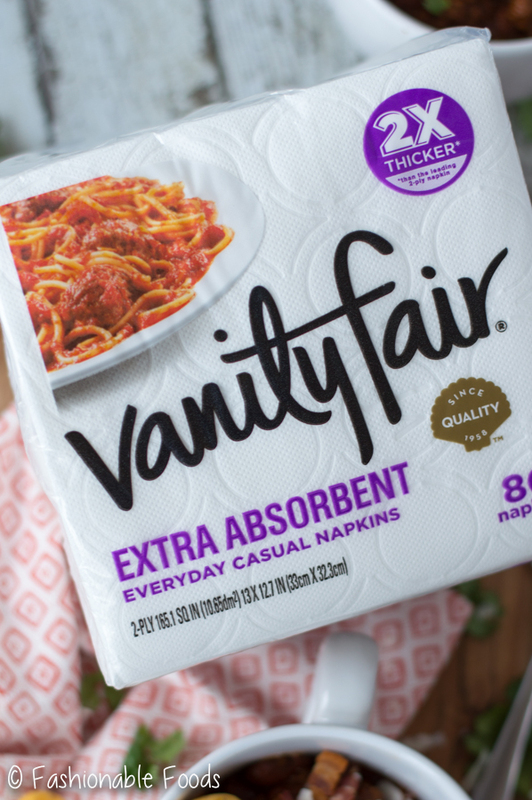 Luckily, Vanity Fair® has come up with the perfect solution… extra absorbent napkins! Vanity Fair® Extra Absorbent Napkins are the perfect accompaniment to messy mealtimes. They are thick, soft, and look great too! I don’t know about you, but when I’m entertaining I always like to have nice napkins on my table. 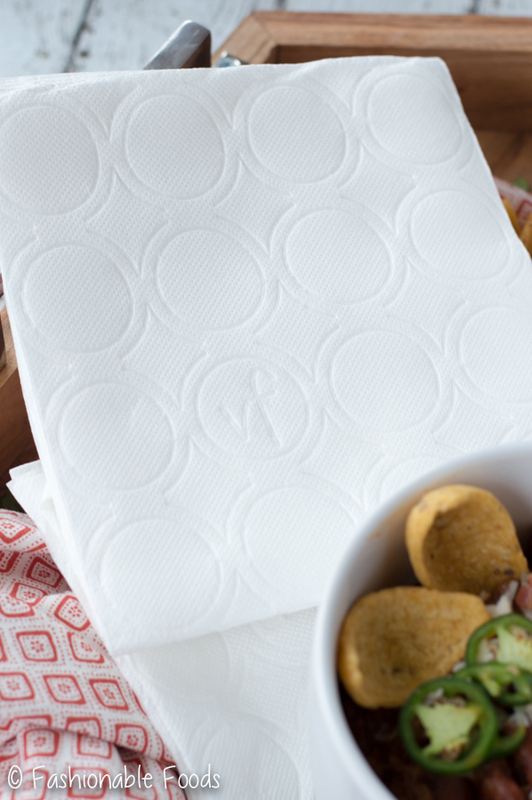 No more (embarrassingly) folding up paper towels to look like napkins! I decided the ultimate test for Vanity Fair® Extra Absorbent Napkins was my husband, Kyle. One of my favorite things to do during the winter is eat dinner by the fire. I can almost guarantee a mess with Kyle eating anywhere other than a table. I’m not sure what it is, but he always makes a mess – especially with chili! 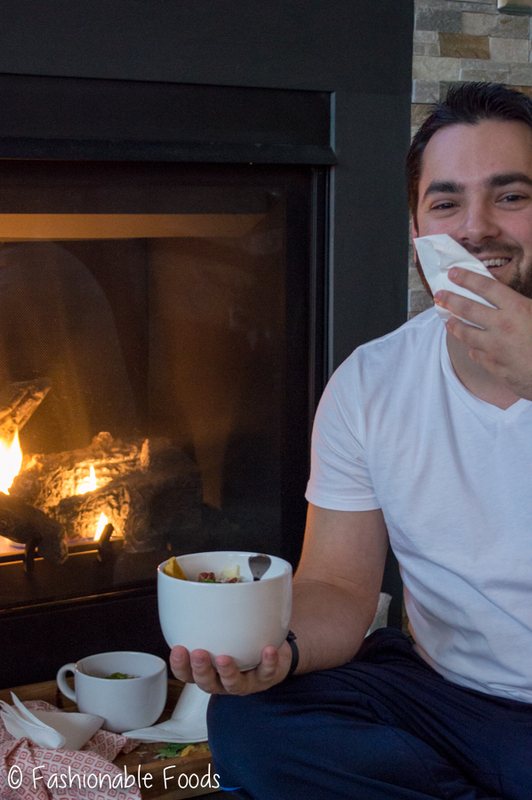 Vanity Fair® Extra Absorbent Napkins held up perfectly to the chili and Kyle’s beard. NO shredded napkins here! I can’t completely throw the hubs under the bus when it comes to messes since I spilled some of the chili while I was ladling it into bowls. But yet again, Vanity Fair® Extra Absorbent Napkins were up to the challenge! These surprisingly absorbent napkins were perfect for wiping the mess! It’s time to rethink the napkin and stop using paper towels at mealtimes! Vanity Fair® Extra Absorbent Napkins are the perfect solution to contain the messes while still keeping things classy. 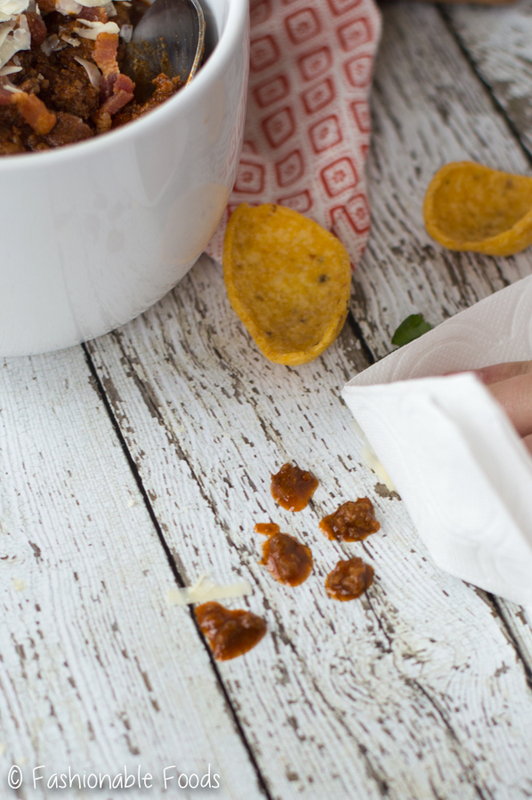 Now that I’ve found my favorite chili recipe (and the perfect napkin! ), it’s going to become a staple in my meal rotation. I hope you love it as much as I do. Cook the bacon in a 4-6 quart dutch oven over medium heat until crisp. Remove the bacon to a paper towel-lined plate (leaving the bacon fat in the pot) and set aside. Add the ground beef and onion to the hot pot and leave it untouched for a few minutes to get some color on the beef. (I do this in two batches in a 4 quart pot, so half the beef and half the onions, then remove and repeat with the remaining beef and onions). Remove the beef and onions to a bowl, leaving any fat behind in the pot. Add the garlic and jalapenos to the pot and sauté for a minute or until fragrant. Stir in the salt, pepper, chili powder, cumin, and cayenne pepper. Allow the spices to toast for 30 seconds to 1 minute before adding the beef/onion mixture back to the pot. Mix well. Stir in the kidney beans and tomato juice, making sure to mix well to get everything combined. 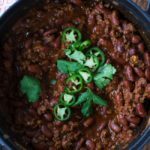 Bring the chili to a low simmer and then reduce the heat to low, cover, and allow it to simmer for at least 45 minutes or up to 2 hours*. 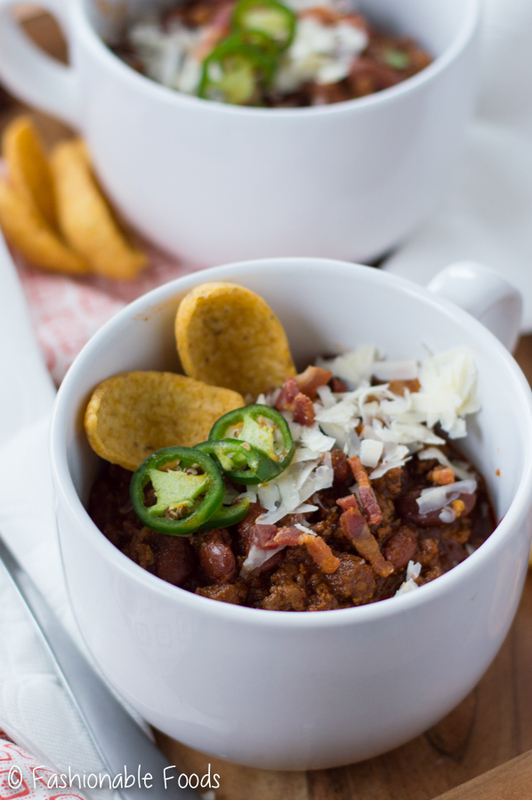 Serve the chili with your favorite toppings and enjoy! *I leave the seeds and ribs in the jalapenos as we like added heat to the chili. You can certainly remove them for a mild chili. 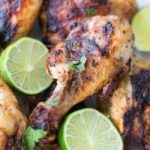 *Ancho chili powder is preferred over “chili powder” as it’s pure ancho chili powder and gives the best flavor. Spices labeled chili powder are typically a mixture of spices. If you can’t find ancho chili powder, use the same amount of chili powder, but omit the cumin. *Chili is best when made ahead and allowed to sit overnight in the fridge. It’s certainly tasty after simmering, but the next day it’s always better after the flavors have time to meld. If possible make it the day before you want to serve and then just heat it up on the stove before serving! Wow! I had never thought of making my own bowl of chili before. I always preferred the store bought “canned chilis” I review on my site. But your recipe sound so yummy. I am definitely going to give it a try and I will get back to you with the outcome. I hope I will nail it! and it comes out just like yours. Thanks for this recipe and please keep sharing. OMGGG! I need to make this. I love chili!! 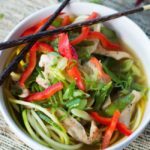 Thanks for sharing this recipe!!!! !